Amy Penrose, “the Craft Beer Girl,” is today’s highlighted artist. 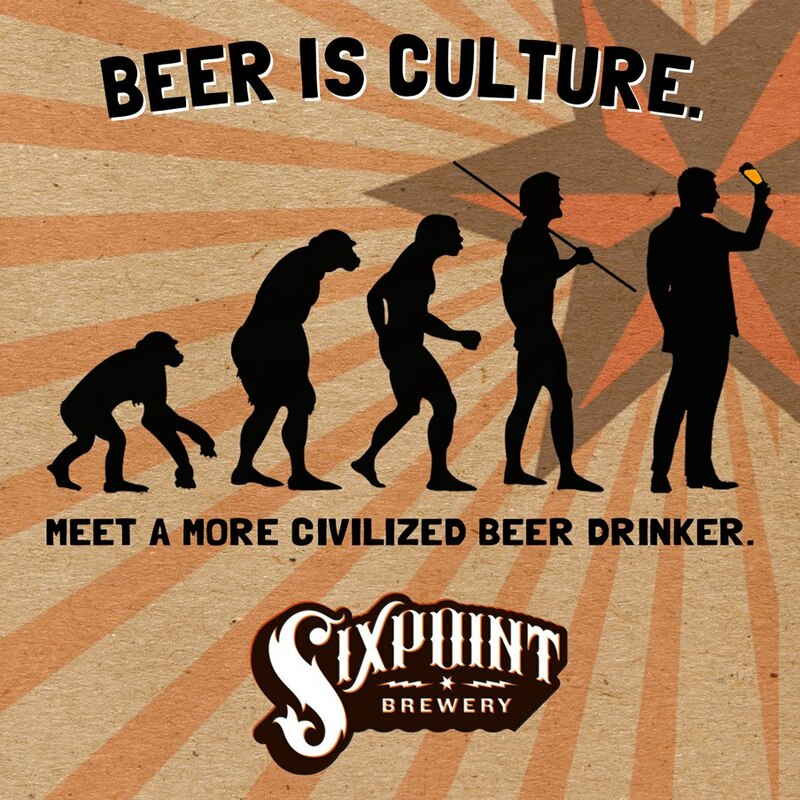 Her rendering of beer drinking evolution speaks to the cultured endeavor that the experience can be. The enlightened man enjoys a Sixpoint brew! Learn more about her inspiration, her thoughts about beer drinking as communal, and her take on the Sixpoint motto below. I remember seeing last year’s Beer is Culture submissions and loving the theme and the art! So when I saw the call for entries this year, I knew I wanted to submit a design, I just had to come up with a concept. I even wrote myself a note and stuck it next to my computer so that I wouldn’t forget. Well… days went by and I hadn’t come up with any great ideas, and then it hit me. I had actually already been working on this design (but with a female beer drinker) to promote my blog, theCraftBeerGirl.com. Just a few quick adjustments to add the Sixpoint logo and six-pointed star, and viola! It was ready for submission! I’ve been interested in art since I was a little kid. I took a lot of art classes in high school, and continued as an Art Studio major in college. Though I’ve received plenty of formal art training, most of my computer skills are self-taught. I’ve been using Photoshop since I was a teenager and have gained most of my knowledge by just playing around and experimenting. Computers have allowed artists to blur the lines a bit when it comes to art mediums. Artwork can be produced using a single program from start to finish, or it can be used in combination with more traditional methods. We use computers to mock traditional methods, digital photographs with simulated light leaks and grain to resemble the imperfections of film, or Photoshop brushes that mimic paintbrush strokes. But we also use computers to create new unique effects, like the compression artifacts found in “glitch art”. Just like conventional art forms, the definition and interpretation of digital art is subjective and unique to the viewer. I am enchanted and challenged by storytellers. One of my favorites in the beer scene right now is Michael Kiser and his site, Good Beer Hunting. His photo essays make me wonder if we live in the same world, everything just looks a little lovelier through his lens. I am also a sucker for hand lettering and typography, and have been crushing hard on Sean McCabe’s work. You can find much inspiration at his site, http://seanwes.com. For me, beer is all about community, and culture is a main component of communities and vice versa. I’ve met so many amazing, kind, and creative people through my participation in the craft beer community. Whether I’m enjoying beer at a local bar, visiting a brewery, attending a beer event, or connecting with beer drinkers around the world online, the things that unites us is the beer, but we form a common bond as people.